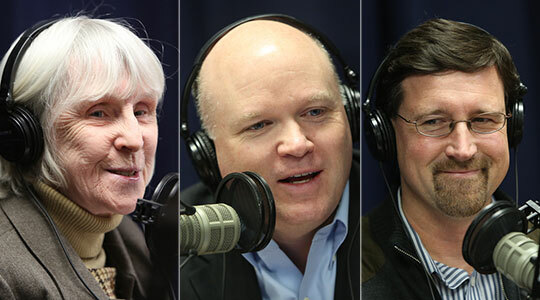 Summary of today’s show: Our usual Thursday panel of Scot Landry, Susan Abbott, Gregory Tracy, and Fr. Roger Landry considered the news headlines of the week, including the blizzard about to hit New England; the Catholic Appeal reaching its goal; vandalism of churches; news of priests, including the legacy of Bishop John D’Arcy; the beauty of Chartres Cathedral; and preparing for Lent. 1st segment: Scot Landry welcomed everyone to the show and he said all the news coverage of the big storm tomorrow drives him crazy. It used to be that we were tougher. Susan said now we don’t want to be inconvenienced by anything. On the other hand, she’s very excited by the storm. Scot noted that we’re celebrating the 35th anniversary of the Blizzard of ‘78, which was a devastating storm. He remembered being out of school almost for the entire month of February. Greg said he too remembers the storm as a child growing up in Walpole and seeing people having to cross-country ski into the center of town to make a supply run. Scot said the 2012 Catholic Appeal wrapped up its year and announced that it has beat its goal by raising $14.2 million. They also had about 2,500 more new donors this year. Scot read the highlights from the story in the Pilot. Three churches, including two Catholic churches, were vandalized by someone with the message that religion is brainwashing. The pastor asked for prayers for the vandals. Greg said in April the churches in Wilmington are planning a rally to say the town welcomes people of faith. Also in the news, Fr. Dennis Deaver, who has been pastor at St. Clement in Somerville/Medford, has now entered retirement status. He, too, grew up in St. Charles Borromeo in Woburn, like many other priests of the archdiocese. He spent years working with the St. James Society in Ecuador as well as parishes in the Archdiocese, including since 1985 at St. Clements. Fr. Edward L. King also died at 89 years old. He was recruited for professional baseball but decided to enter the priesthood. On Tuesday, we profiled and gave thanks for the life of Bishop John D’Arcy, a native of Boston and bishop emeritus of Fort Wayne-South Bend, Indiana. Susan said she got to know the bishop over the past three years after his retirement. He spoke to students and faculty of the Master of Arts in Ministry program at St. John Seminary on the spousal relationship between bishop and diocese. He talked about going through a grieving process over the loss of his spouse. He also said we should never study theology, except on our knees. Fr. Roger Landry joined the show by phone and discussed the legacy of Bishop D’Arcy, who will be remembered as a bishop who loved his diocese and how he is universally admired in his diocese. People will come to recognize that he was the type of priest and bishop everyone across the Church deserves. Also in the Pilot, on March 12, a presentation will be hosted on Chartres Cathedral in France. Greg talked about going to visit Chartres and being so impressed by its beauty. Professor Paul Crossley will explain the story of the Gothic Cathedral. 800 years ago these buildings were the biggest structures that most people ever saw. Scot said the stained glass windows are among, if not the, most beautiful in the world. Fr. Roger talked about a pilgrimage he’s leading to France later this year, including a stop in Chartres. 2nd segment: Scot noted that Lent begins with Ash Wednesday next Wednesday and we typically talk about Prayer, Fasting, and Almsgiving. In his column this week, Fr. Roger encourages us to live Lent with audacity. We should live our Lent as Christ did. We need to ask ourselves how to grow as persons who pray all day. When we fast, don’t do it as weight loss, but as mastery over our lower instincts that sometimes dominate us so we can give ourselves wholly to the Lord. Almsgiving isn’t just change in the Rice Bowl box, but also giving of ourselves completely to others. He said when he hears confessions before Lent, he asks about Lenten penances and most people don’t remember what they did last year. He encourages penances and practices that will really make us saints. We need to increase the quality and quantity of our prayer, to live our fast, and to be seriously becoming other Christs in the way we sacrifice for others. He said an example of fasting is to give up condiments: butter, salt, pepper, ketchup, etc. He forsakes sweets and snacks between meals. They help us have self-discipline and to appreciate what we have. He also encourages drinking nothing but water for Lent. He also suggests fasting from television during Lent. Scot and Greg talked about how we are in charge of our own Lenten program. Fr. Roger said a resolution and a wish are two different things. A wish would be I want to lose weight, while a resolution would be I won’t eat between meals. Most people make wishes in the spiritual life. He said many of us have become spiritual sissies. Susan said all these steps are doable, they’re not all that difficult. Scot said he loves Ash Wednesday because it’s not a holy day of obligation but everybody goes. He said he loves that we’re willing to mark ourselves with our faith for everyone to see. Fr. Roger said if people can’t go to daily Mass in Lent, they can watch it on CatholicTV.com or with an app on their phone. They can make a real sacrifice of their time by giving at least a half hour of their day to someone who needs them. That’s almsgiving of time. Scot added that we should do it all joyfully.